The cronut craze has everyone talking lately as it is essentially a croissant cut into a donut shape and then deep fried. Chef Dominique Ansel invented the cronut in his New York bakery in May 2013. Since then, everyone has either lined up in Chef Ansel's line for their requisite 2 cronuts or attempted to make a homemade version of cronuts. As I am unable to fly to NYC at the moment, my husband along with a few of our friends decided to try making some cronuts at home. After some research we focused on two cronuts recipes. One from Dinner with Julie (DWJ) and another from Lorraine at Not Quite Nigella (NQN). We also made a third batch using pre-made Pillsbury croissant dough to compare with the two homemade cronut recipes. We made some thorough comparisons but if you like you can jump straight to the conclusion. The first dough that we made was the one from NQN. She has some excellent step by step photos on her site as well. The ingredients you will need for her recipe are pictured below. Using a scale helps to accurately measure out all the ingredients. Prepare the yeast in warm water with a bit of sugar in a small bowl. 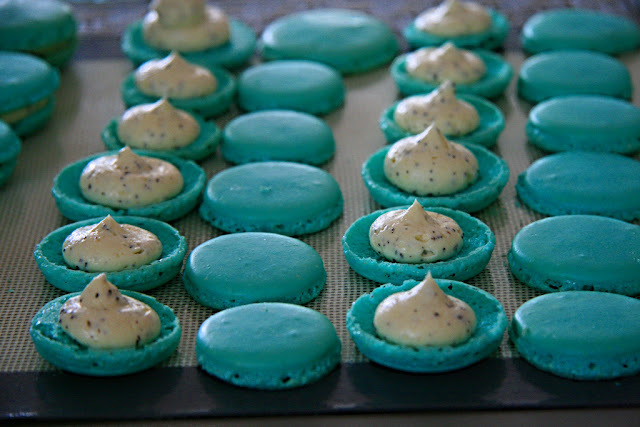 Set aside in a draft-free place (we often place it in the microwave) so that the yeast and sugar can foam. Heat the milk (just until tepid), add the salt and rest of the sugar. In the bowl of the KA, add the flour, oil, yeast mixture and milk mixture. Mix it all together with the paddle attachment or with a spatula (if doing by hand). Once all the ingredients are incorporated it will look like a free form ball.Place the ball of dough onto a floured surface and smack the dough onto the surface 8-10 times. Wrap the dough in plastic wrap and allow it to rest for approximately three hours. It should triple in size. Follow the folding method on NQN's website for the butter and dough folding process. At the end of several folding/laminating here is what NQN's dough looked like right before we flattened it and then cut out donuts. Super puffed up croissant dough right before the rolling & cutting process. The second dough we made from scratch was using DWJ's recipe. Ingredients for cronut recipe 2. Main difference is the addition of eggs. 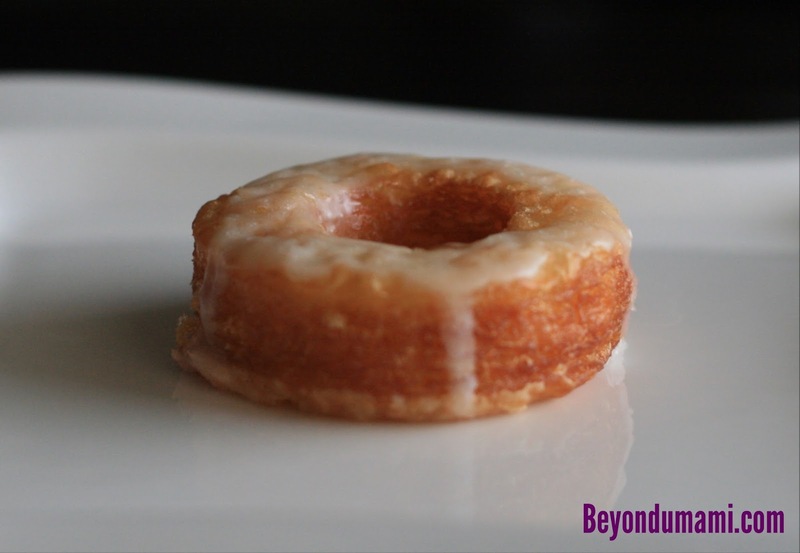 See Instructions on Dinner With Julie's Cronut Recipe. Pictured below is the process of folding the butter into the dough - the laminating process. Lastly, we bought a can of Pillsbury Crescent Roll dough to see how it would compare to the homemade doughs. Contains 2% or Less of: Dextrose, Vital Wheat Gluten, Salt, Sodium Stearoyl Lactylate, Potassium Chloride, Xanthan Gum, Artificial Flavor, Yellow 5, Alpha Tocopherol (to Protect Flavor), Color Added, Red 40. Rolling out the Pillsbury dough for cronuts. 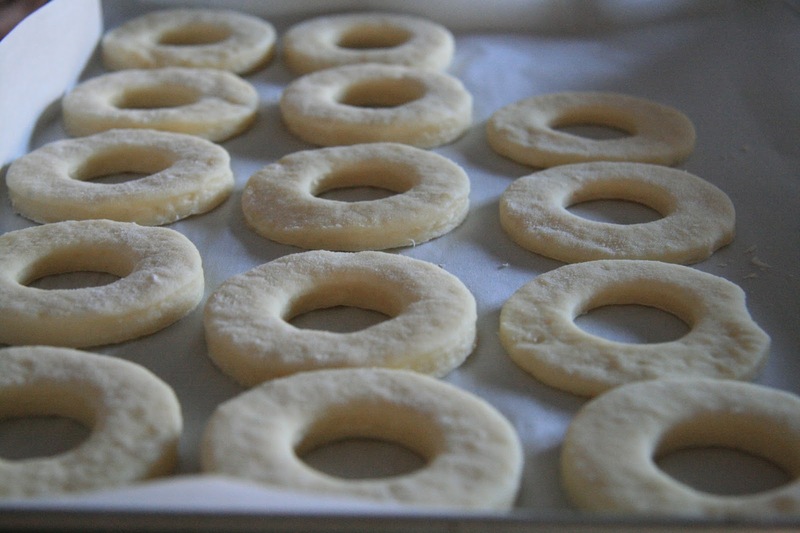 Cut donut shapes from sheet. So, what you are probably really wondering is if there were any differences at all between all the doughs. Here are the blurbs! If you want to skip the explanations, continue scrolling through to look at the pictures! The directions are pretty similar to most homemade croissant recipes. We have made croissants before and both NQN and DWJ's recipe are very similar to standard croissant recipes. One striking difference is that NQN's recipe activates the yeast as opposed to DWJ where you simply mix the dry yeast without activation. After making both recipes, it didn't seem like activating the yeast made a significant difference in proofing time as both recipes require you to proof for a long time (approximately 12 hours). NQN also double-stacks her doughnuts after cutting making it noticeably thicker than DWJ's version. The Pillsbury pre-made crescent roll was very simple as it required no extra steps after opening the can and unrolling the sheet. 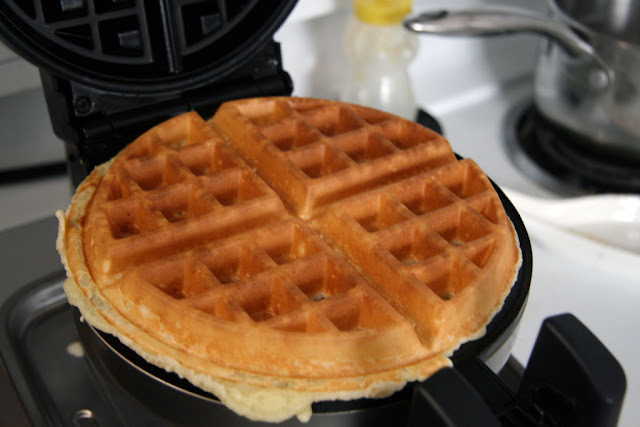 were double stacked prior to deep frying resulting in a thicker and fluffier look. One noticeable ingredient difference between DWJ and NQN is that DWJ's recipe uses eggs in her croissant recipe while NQN does not. NQN's recipe also uses a slightly different amount of yeast as well. The Pillsbury's crescent rolls contain a few extra ingredients for preservation purposes but it has a noticeable inclusion of baking powder and partially hydrogenated oil (see notes on taste). Dinner with Julie's cronut recipe after deep frying. I asked each of the authors the reasoning behind their ingredients for their croissant recipe. Julie indicated that she was looking for a rich pastry dough with a specific mouth feel. Whereas Lorraine from NQN replied that she was focused on getting layers in her croissants while balancing the yeast content. A good croissant requires a few laminations. 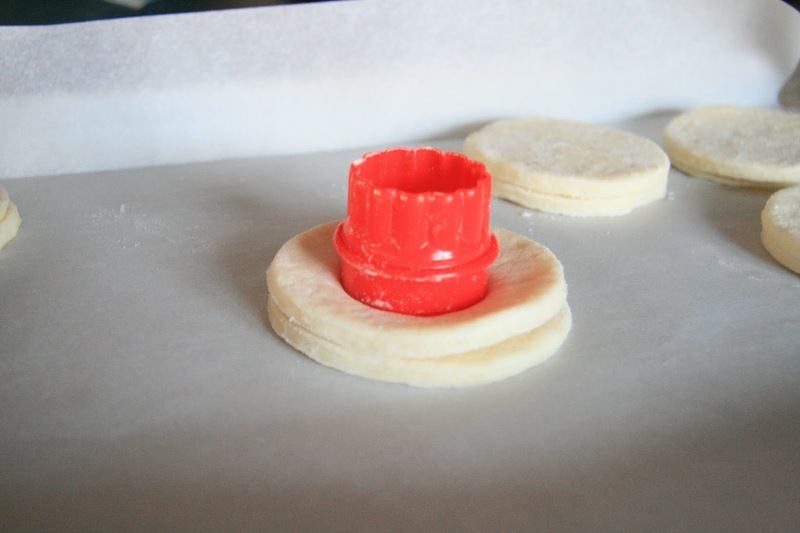 Laminating dough is the process where you flatten the dough and fold it on itself. Lamination creates the flaky layers of butter and dough that we all love in a great croissant! Dan noted that DWJ's recipe was resistant to being rolled thin and stiffer in comparison to NQN's. We think it might be stiffness of the DWJ recipe might be due to the eggs. All that being said, Dan had a really good workout laminating the doughs several times. Deep-frying is a crucial and necessary step in making cronuts and while deep frying is relatively straightforward there were differences between the different doughs in hot oil. The Pillsbury cronuts literally inflated as they were put into the oil, and were squishy throughout the entire frying process, the Pillsbury croissant also stayed soft and squishy like a sponge soaking up oil. Both NQN and DWJ's croissants became stiff and crispy after being deep fried. The Pillsbury cronut after deep frying. Everyone agreed that NQN's cronut recipe seemed flakier (likely due to the dough's easier lamination and the double stacking prior to deep frying) and DWJ's cronut recipe was more cake like. On the other hand, the Pillsbury cronut tasted like a conventional donut, except oilier (possibly due to the significant amount of oil in the ingredients. After trying out three different homemade cronut recipes, I really enjoyed the taste of Dinner With Julie's version; however the layered look in Not Quite Nigella's cronut recipe was aesthetically pleasing. I would recommend not rushing and taking the quick route of using Pillsbury ready-made crescent roll as it did not look nor taste anywhere in comparison to the homemade versions. I would consider making cronuts again using Dinner With Julie's version and double-stacking it. I would suggest making this with several people as they're best enjoyed fresh out of the fryer. As much as you would like to eat every single cronut and crobit yourself it's best for your health to share the task of making and eating with friends! deep fried dough - you guys really know how to have a good time! Thanks Su! It was quite an awesome party! Definitely had lot of cronuts to go around. I'm not sure if we will do cronuts again, but there were some good croissant recipes that we used. We will most likely try making croissants from those recipes :). Thanks for visiting!